Picture a burglary and you’ll likely think of a smashed door lock, or broken window. But did you know that one third of burglaries are classed as simple “unlawful entry”, with no forcible entry to the home whatsoever? Of the 1,420,000 burglaries recorded in the USA 2015, an astonishing 504,000 saw the intruder enter through an unlocked door, window, or other unsecured entrance. Securing your home and double-checking every window and door is time-consuming. Sometimes you’re in a rush to leave and you forget. Sometimes it’s late and you’re tired. Sometimes you remember an open window when you’re halfway to work, but opt to put it to the back of your mind and hope for the best. Most likely you’ll be fine, you figure. And… presto: you’ve given an opportunistic burglar a free pass into your house. How does smart home security safeguard you? Our smart home security technology is designed to make it fast and convenient to secure your home properly. 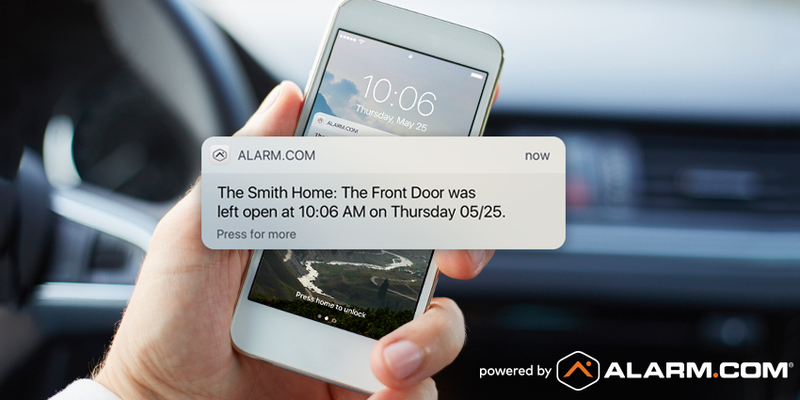 With its combination of smart, connected hardware and automated security intelligence, it can even step in proactively when you forget to lock up. 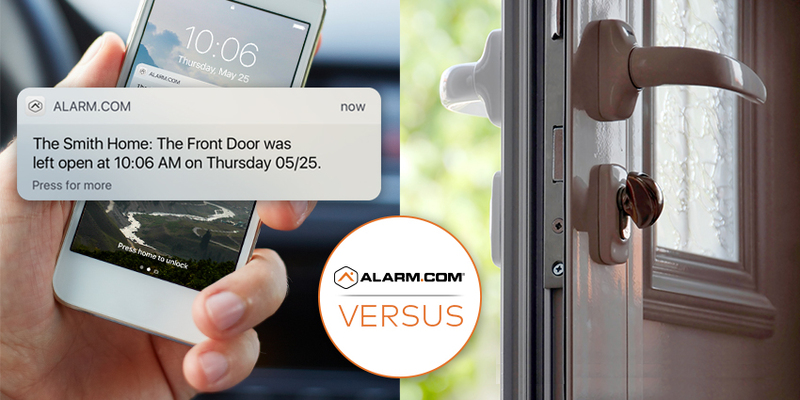 Alarm.com makes it easy to quickly check your doors, windows and garage door without having to dash around the house before you leave. A quick glance at your Alarm.com app can show you the status of every window with a contact sensor on it, and every smart lock in your home. If you’re prone to forgetting, it’s easy to create an Alarm.com reminder. Our Geo-Services feature gives you the option to get a smartphone alert if you leave home with a door or window open. If it’s a smart lock or smart garage door you left open, you don’t even need to turn around: the alert will come with a ‘lock’ or ‘close’ button so you can secure your house with one tap. If you like being efficient, another option is to create a “Lock Up” or “Leave Home” scene for your Alarm.com app. Scenes are customized commands that trigger several devices at once. You can create a Scene button that locks your doors, closes your garage and arms your security system, then simply press it every day as you leave for work.